Designer real-gem jewelry: necklaces, pendants, bracelets, earrings. The best accessories to go along with fur products, i.e. leather gloves, handbags embroidered with beads and natural gems, jewelry from natural gem stones, necklaces with black agate, earrings, bracelets from jasper, turquoise, agate, coral, ammonite, labradorite. In Natesse on-line store you can choose the accessories of fur and leather of the highest quality. Democratic prices for luxury fur products will allow you to create an individual image. Luxury fur coats have always been the faithful companions of women, as well as gorgeous jewelry, which at all times are the best addition to any image. 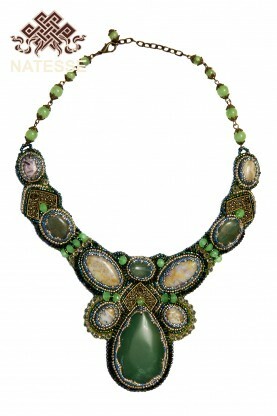 Authentic ornaments from natural stones are perceived very warmly by fashionistas worldwide. 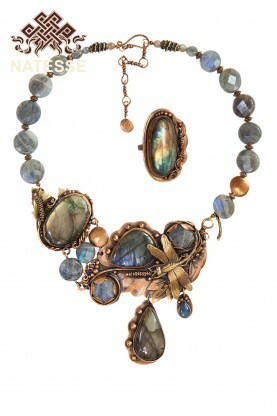 To make your image complete, choose exclusive jewelry, which will surely draw men's attention to you. Over years, we have studied the needs of most of our clients, so we know exactly what accessories they would like to wear with their fur coats. The professional craftsmen of our lab create their own earrings, bracelets, brooches with natural stones, gems for our customers worldwide. Manual work has always been highly appreciated, and today you can buy such products and be sure of your unsurpassability and uniqueness. 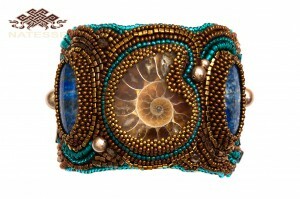 Our clients across the world also have fallen in love with clutch bags, embroidered with beads and natural gems. Semi-precious stones agate, onyx, amethyst, jasper, tiger's eye, turquoise, ammonite, aventurine, lapis lazuli, labradarite will look great against the background of a soft and elegant fur coat, such contrasting combinations will supplement your image with sexuality and magnetism. Also our products are decorated with Swarovski stones - famous and most popular all over the world. 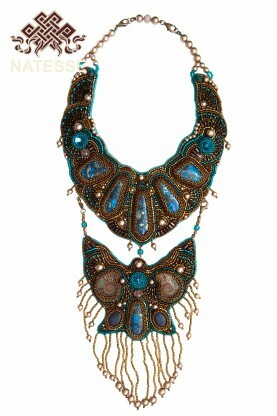 You will also find in our collection necklaces and pendants featuring various natural gems. This is the most feminine jewelry that you can select for your elegant coat. 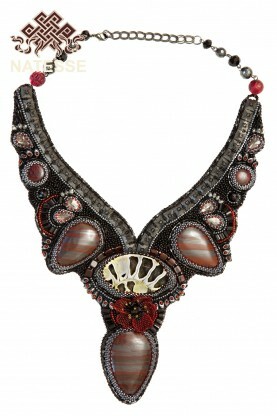 These will emphasize your beautiful neck and décolletage zone, and will become your true zest. Our natural-stone decorations and accessories have already become quite popular around the world, and today we want to give bright and unusual jewelry to women. Perhaps our collection is not too big, but it is noteworthy that we create our own jewels for your elegant fur coats. Indeed, it feels good to have in your arsenal some vintage jewelry and understand that those are unique and one-of-a-kind. Visit our online store, where all products are presented on photos. In real life, these unique products look much more chic, they shimmer with bright colors in the sun and emphasize your impeccable style.